American state and local economic development (ED) has been around since Day One of the American Republic. Recognizable forms of many current ED strategies and programs can be found by the 1880’s and tax abatement, eminent domain, business attraction, venture capital, and even urban renewal were evident in the early 1800’s. You may be surprised to know George Washington was an investor in canals and the earliest advocate for building a new capitol–partly on land he owned–and his Secretary of the Treasury, Alexander Hamilton was a principal in America’s first industrial park, in New Jersey near where he was shot. Bet you never knew Lincoln partly financed his Lincoln-Douglas Senate campaign from a law suit in which he successfully defended the state of Illinois railroad tax abatement. He also ran on an economic development platform in first campaign for public office in 1831. He lost. If the reader is thinking they already “know” our history, that, for example, the “three waves” summarizes it all, I’d bet you would be quite surprised. There’s lots more surprises in the history and three waves doesn’t even come close to summarizing it. 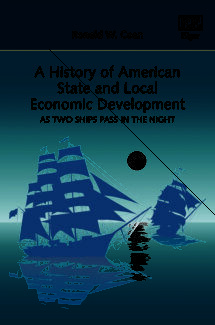 My recently-published “History of American State and Local Economic Development, 1789-1990: As Two Ships Pass in the Night” (As Two Ships) outlines that history from 1790 to about 1990—all 752 pages of it– uncovering four distinctive “Eras”, and surprising movements, leaders, and an amazing variety of ED strategies and programs at both city and state levels throughout the nation at any one point in time. Perhaps the most startling revelation about American state and local ED is that it is bisected by two competing approaches, community development (CD) and mainstream business assistance (MED). These different paths to American ED differ on goals, strategies, beneficiaries, policy-making styles,and philosophy. As we look at the goings-on in our Contemporary Era, it is not an exaggeration to say the two approaches are at war. These are my Two Ships Passing in the Night. This issue discusses core fundamentals by introducing my “Chapter One Model”. It introduces the two approaches to American ED: Privatism/Mainstream ED–and Progressivism/Community Development. The Chapter One Model is the “story” told to me by that history. It is why I think American ED’s history and chronology unfolded as it did. It offers, I think, considerable insight to the present day, and suggestions pertinent to our future. The model provides meaning, understanding, texture, context, perspective and a sense of what has been important to economic and community developers over two centuries. It provides today’s economic developer with a record of proud achievement of her and his profession’s role in the success of America. Since colonial history two different and often conflicting approaches/styles to American ED were evident: mainstream economic development (MED) and community development (CD). These approaches are closely tied to the two dominant American political cultures: Privatism, and Progressivism. Each culture rests on its distinctive values, experiences, preferences, and beliefs of current community residents–as well as those residents who currently rest in its cemeteries. These two cultures exist in different versions and varying strength in every community and state in the nation. They vary across the four regions of America and change over time by putting on different semantic “clothes”. But underneath the clothes they have changed remarkably little. Cultures influence local policy agendas, shaped local policy-making institutions/decision-making and over time evolved into a distinctive and durable ED “style” or “why things happen” in each specific community/state. Today they constitute a major element of what is commonly referred as “Red and Blue” economic development. Immigration, internal migration, and generational cohort migration transmitted these cultures across time and geography. But how they have differed from each other has not changed very much. The bottom line is that community development wants to help “people”, especially the downtrodden and disadvantaged–and mainstream ED believes the best way for the community to grow and prosper is to assist the companies resident in the community’s economic base to grow and prosper. They target different beneficiaries and operate in different levels within the community (neighborhood or community-wide), and when they collide–say in the city council or in a public hearing–watch out! Mainstream ED (MED) accepts capitalism, prefers limited government, believes in a natural human inequality, and is willing to provide direct business-assistance by lowering costs of doing business, attracting a skilled but inexpensive workforce, and promotes a friendly business climate to encourage investment. Tightly connected to the jurisdiction’s resident industries and sectors (and their corporate owners/managers), MED values retention as well as attraction of new companies and advocates a strong public role to provide the necessary physical infrastructure. In tune with capitalism’s competitive ethos, MED competes instinctively with other urban jurisdictions, even nations, for economic prosperity, prestige and even their citizens as tourists and potential new residents. MED has been America’s dominant state and local ED approach–the approach most citizens and media instinctively label as “economic development”. A competing “people-centered” approach, however, also exists alongside MED. Focused on a community’s economically/politically disadvantaged residents, CD pursues strategies and programs, and sometimes “mobilize residents into “movements” (think Alinsky) that economically and politically empower neighborhoods and their ethnic/racial/immigrant minorities. Community development has proven itself especially sensitive to population migration/immigration and is fueled by the inevitable inequality/social injustice that accompanies it. CD resents and intensely resists economic (and status) competition between cities, states, regions, and nations that creates opportunities for “mobile capital or capitalist investment” that enhances inequality and injustice. CD’s ties to the local or state capitalist economic base is tenuous indeed. Uncomfortable with capitalism, profit and corporations, CD offers a strongly anti-capitalist contrarian approach to American economic development and the EDOs of mainstream ED (chambers for example). Through much of American ED’s history, CD has been off doing other things (women’s vote, education, mental illness, abolition, temperance, slavery, and in modern times civil rights, climate change, and in recent years, identity issues). But since the 1960’s thanks in large measure to the federal government, CD and CDOs today challenges MED in most American jurisdictions. In our Contemporary Era cities and even states, CD has “taken over” and stresses a neighborhood-level quality of life, sustainable, people-focused policies (housing-related, for example), while pushing MED onto private EDOs like chambers, downtown BIDs, tourism promotion agencies and regional marketing/cluster development entities. Some EDOs, like workforce and small business/commercial revitalization agencies bridge both approaches. Simply put, there is no one way ED is practiced in each of our communities, jurisdictions or states. They both coexist and compete in each. Each lodged in different EDOs and drawing support from different constituencies. They practice and advocate two very different approaches to economic development. Often cities, like the federal government (EDA and HUD), have established two separate EDOs, a department of ED and a department of housing and CD for example. Insight Two: Why Is Progressivism and Privatism so Important to Economic Development Strategies? As Two Ships describes how our two political cultures diffused through the nation–and how they enter into our strategies, tools and programs. Diffusion is easy. Culture travels in wagon trains, broken-down “Grapes of Wrath”cars, Great Migration trains, and today, simply going to an out-of-state college or crawling through a border tunnel. When people migrate they bring their values and preferences with them. There may be a lag time, but sooner or later these values emerge and affect our municipal and state elections, and policy preferences. A no-longer surprising reality, its the so-called Big Sort. We don’t just travel anywhere, we travel and stay at a locations we think is congruent with our values and aspirations. That’s how we get Red and Blue states/cities. Economic development strategies come along for the ride. The real trick is to explain why the values and culture of a city/state’s first settlers–often literally hundreds of years ago–affect ED today? The answer is not that weird once you accept that ED strategies are an output of a city/state policy system. Policy systems are run by living people, of course, but usually the policy-making structures that produce ED policy reflect and are fundamentally shaped by political structures that were constructed using the values and beliefs of long-past generations. How? State constitutions are very important. Sub-state policy systems are legally “creatures of the state”. States and state constitutions determine who does what in each state’s administrative system. Counties mean little in New England–they mean a lot in the South. That is just one example of many (other examples are forms of government i.e. mayors or city managers, electoral systems, municipal charters, relationship of private sector to the public, and judicial precedents). Some states prefer to do most “ED” at the state level or through counties; others leave it to cities and local communities. The amazing part of this discovery, is that these decisions were made hundreds of years ago (in the older states) and the issue of “who does what” (for example) has in 2017 literally become the expected way on how to do business–few even notice it anymore. “It’s just the way things are done here” “You can’t do that here!”. That goes a long way to explain why the city of Houston’s strongly entrenched business–led ED policy system has changed little from the its first settlement in the 1870’s. Another surprise is that new cities are formed each year–the first settlers are still city-building. Think suburbs. Think master-planned communities like Irvine California and Woodlands Texas. Virginia’s largest city, Virginia Beach, became an independent city in 1952 (Virginia Beach contains Jamestown founded in 1607). That’s hogwash you counter! Look again. Yes there is home rule, but who decided what was included in home rule and what wasn’t. And, BTW, most states don’t change their state constitutions very much. The present-day Massachusetts state constitution was adopted in 1788–but it was actually written in 1780 and simply carried over into the new American Republic. When states do adopt a new constitutions, they usually use the old one as the “base”–and after a hundred years do you think you can simply “amend” fundamental city/state relationships and powers with a new section of law? If the change is too dramatic, it would never be approved. In many states, the structural political culture embraced in the original state constitution was a compromise between two or more migratory flows peculiar to the state/time period If the first settlers in a city (city charter) or state were Progressives or Privatist a few fundamental values that reflect these cultures got written into state constitutions and city charters–and they remain there today embedded in our state and local policy systems. The Arizona state constitution was written by Progressives and it has subsequently frustrated and impaired the flood of Privatist governors that followed. “As the twig is bent”, so grows the tree. That different cultural “regions” existed, and affected ED, is nothing new to ED. While no means the first[i], Joel Garreau’s, the Nine Nations of North America[ii], is perhaps the most well-known. I rely mostly on Woodard and Barone[iii]–and others. If certain ethnic groups like Yankees or Scotch-Irish piled into a state,or even a region, they brought with them their ideas and embedded them into the policy-making structures of today’s policy systems. Try changing them and you’ll quickly discover why they are still around so long. In any event, American state and local economic development is seriously different in each of the nation’s regions(and within different parts of each state). There is one key ED “structural” decision that is really fundamental to ED–absolutely critical to mainstream ED: how public and private sectors could do business together. How they could partner to modernize infrastructure? How could business firms use public taxpayer money to benefit themselves and the community at large? What kind of EDO was needed for these two players to work together? What kinds of “powers” did that EDO need to accomplish its mission or project? Could an EDO issue a tax-exempt bond/loan/venture capital for private benefit? How about for a sports stadium? These powers are tools for growth and reversing decline to an economic developer There is a host of such tools (tax increment financing, historic preservation, earned income tax credit, eminent domain, tax abatement, and (hold your breath) civil disobedience are the 800 lb gorillas in our tool box) [Talk about mixed metaphors–I love it]. These are really important ED tools and programs–absolutely essential to have if we want to use strategies like attraction or retention or urban redevelopment. If you think about it cluster development and innovation (public venture capital) and regionalism all are tied into this stuff. These tools did not enter our toolbox without struggle or controversy. A lot of it came very early in our history and has been mostly forgotten. Our strategies, tools and programs have been shaped by state constitutional (and subsequent state supreme court decisions). Today we collapse them into the “gift and loan” clauses in state legislation/judicial decisions. What we have almost totally forgotten as a profession is how we forged the appropriate legal and accountable EDO. That was a central struggle throughout the entire 19th century. We did not fashion an acceptable EDO vehicle–the modern port authority–until 1908. Today most quasi-public authorities, urban renewal, community development and housing agencies are a variant of first decade 20th century port authorities–which were an undisputed EDO at that time. Because each state, and their constitutions were forged by the different values of competing ethnic First Settlers, each state has solved this gift and loan struggle in its own way–creating varying systems of economic development within their states. These different constitutions produced huge EDO and strategy variation among state/local ED/CD programs. Today there are fifty distinctive state ED policy systems. Economic development is done differently in each state because of these gift and loan clauses. If you don’t believe me–take a job in another state. BTW the differences can matter–a lot. The commonly-shared “history” of ED for most economic developers is the “Wave” Paradigm. The Wave Paradigm started out by summarizing our 19th to mid-20th century history as a period dominated by chambers. It was not a proud history but one dominated by private greed and silly business boosterism. Wave advocates advanced this view of our history to explain–and justify–the obvious post-1970 rise of state and local government EDOs. That development was “good”; we were separating ourselves from greed-driven ED and serving community goals. In the decade that follows, decades in which chambers lost their formerly dominant position in American ED, the Wave Paradigm expanded into post-industrialism and the ED strategies relevant to a post-industrial era. Those strategies, however, resulted from twenty plus years of research and critical debate (labeled the Great Reindustrialization Debate which ranged from the early 1970’s to middle 1990’s) concerning how best to respond to what we today call deindustrialization. For the most part, those strategies which were endorsed by the updated Wave Paradigm became in our Contemporary Era, so-called “Blue State–entrepreneurial, creative, knowledge-based–ED strategies”. What was not included in those strategies was relegated to the discredited and mostly abandoned “First and Second Waves”. The profession and policy area had moved on, progressed if you will. Except no one sent the memo out all the states and cities. In 2017 the so-called First and Second Waves are still around, and the ‘inconvenient truth”, it could be argued that where those discredited waves still operated, there was growth. The First and Second Waves eras were populated by private, business governed EDOs. The residue from the Wave Paradigm is that for many economic developers private EDOs are not legitimate players in modern economic development. Legitimate or not these private EDOs still exist (philanthropic EDOs fund a great deal of community development, for example)–and many are quite successful. In removing private EDOs from our “modern history” we eliminate nearly fifty percent of 2017 operating EDOs. In particular, the idea that chambers can be “legitimate” EDOs is especially controversial in some ED/CD quarters. Many strongly believe EDOs and economic development must be a government function run by a government entity. Quasi-government EDOs that include significant private sector involvement in decision-making are strongly distrusted–think urban renewal agencies or Jerry Brown and TIF redevelopment agencies. The post-Great Recession state “privatization” movement reflects this distrust. So where does a multi-county private sector issue advocacy, regional one stop-shopping, attraction and cluster targeting organization fit in? A university accelerator? Microsoft or Google venture capital subsidiary? Is a chamber running a downtown BID, a tourist destination program, a business networking event, or an education/skills/cluster initiative legitimate? If you asked all economic developers in an audience of metropolitan port/transportation authorities to stand up do you think any would? Do you really think an airport or the NY-NJ Port Authority is not an EDO. It is an EDO–it just specializes on certain infrastructure and a subset of ED. How do you think an audience of workforce development professionals would react? Tourist agencies? Tax-Exempt bond-issuers? Foreign Trade or EDZ Zones? Brownfield or cap and trade? Where do community colleges fit in? Folks, this is siloization and it is a dominant characteristic of American economic development. Take it on step further. Is Alinsky-style neighborhood-based entities a CDO? What about a Main Street? Historic Preservation District? Acorn? Is an “entity” that presses for raising minimum wage or a community organization in a minority neighborhood all forms of legitimate economic or community development organizations (EDOs)? What about a neighborhood revitalization council, a neighborhood preservation corporation, or South Shore Bank? How about a Nehemiah housing project corporation? Get the picture–somewhere in this list most readers are drawing a line. This is and That ain’t. There are a pile of economic developers that relegate the thousands of chambers to the equivalent of ED landfills. Wave theory suggests they don’t even exist anymore–or shouldn’t. They do–and in many communities they are quite powerful and very important to a community’s/state ED. Contrary to wave theory they haven’t gone away. Each still offers an important contribution to our community/state ED. That all of the above is a legitimate EDO or CDO in today’s American economic development profession acknowledges not only the real-life variation and diversity that exists within American ED, but accepts and incorporates Mainstream ED and Community Development into our larger American ED system. It also recognizes that EDOs literally created in different Eras, literally a hundred years ago still exist, still function, and still play a vital role in our present-day Contemporary Era. Within each community, and state policy system, a ton or EDOs and CDOs flourish, cooperate, compete, and even ignore each other as they stumble about “doing their own thing”. Go through your phone book (ha ha) and see what’s got a listing. In big cities the list can go on for pages. Just don’t limit yourself to city government. The reason why we use a “policy system” is that history forced me to. Today the typical ED policy system is a swirl of autonomous private, neighborhood, city-wide and regional nonprofits, municipal-federal-state public EDOs, quasi-government/hybrid EDOs, sub-municipal EDOs (BIDs) all overlapping across ED strategy/program-specific whirlpools. It is a hybrid CD and MED policy system. If one wants to understand the totality of economic development even in a single small town, one must include them all. Sure, there are “lead” agencies, but for the most part they don’t “lead” anybody–they just have more money or power. There is a whole lot of economic development going on. And the reality is no one is in charge of it–or probably should be–or likely ever could be. American economic development is a multi-splendored thing, with many goals, strategies, EDOs, and programs. If one looks at our history, it becomes apparent how all this came to be–in fact, it always was like this (albeit less steroidal), even way back in the 19th century. The As Two Ships historical chronology naturally focused me on past policy systems and how they changed over time. The sweep of more than two hundred years of different policy systems–IN THE SAME COMMUNITY revealed some common patterns and led us to distinguish certain periods of time when American ED did different things, had different priorities, different types of EDOs being created–because ED had to deal with the “world as it existed” at that time. As “the world or ED’s environment changed, American economic development itself has changed –because the city/state policy systems changed. The study of our past is a study of how American economic and community developers had to confront and solve different problems and crises they faced when they looked out their office windows. What ED and CD was in these time periods is not what it is today, just as today’s ED/CD will not be tomorrow’s. There is, however, a serious difficulty with the last simplistic sentence: just when does tomorrow begin? This leads us to our next topic–Change and the Effects of Time and Regions on American ED. [i] My introduction to political culture in 1969 graduate school was Almond and Powell’s, Comparative Politics (Boston, Little, Brown & Co, 1966), and most importantly Daniel Elazar’s, American Federalism: a View from the States (New York, Thomas Y. Crowell, 1966). The “historical” literature is endless, but the 900 page David Hackett Fischer’s classic, Albion’s Seed (New York, Oxford University Press, 1989) would be an excellent start. [iii] As Two Ships relies on Bagatelle, E. Digby. Puritan Boston and Quaker Philadelphia. New York: the Free Press, 1979; Barone, Michael. Shaping Our Nation. New York: Random House, 2013; Bishop, Bill. the Big Sort. Boston: Mariner Books, 2008; Russo, David. American Towns. Chicago: Ivan R. Dee, 2001; Warner, Sam Bass. the Private City (2nd Ed). Philadelphia: Philadelphia University Press, 1968; Woodard, Colin. American Nations. New York: Viking Press, 2011. [v] The same could not be said for Orange County CA—but the explanation for its change supports the As Two Ships model: a population with a different culture migrating into the area. Thanks for another thoughtful, insightful, & comprehensive summary of ED history. Much to digest & reflect upon . . . I would argue that our “profession” suffers from a lack of clarity and common understanding of a major planning concept w/in the public sector where it originated, centered around the evident need for public sector intervention to compensate for the lack of “lifting all boats” consequences in the capitalistic, private sector economic system we supposedly admire and excel in. No one ever defines “economic development” to begin with, but that’s because everyone assumes it means nothing more than business development. How wrong they are! I say if you want to advocate, support & finance private business development, join the Chamber of Commerce, as this is their mission in life. The mission of true “economic developers” is to raise standards of living & quality of life outcomes, in real terms, by leverage public dollars with the private sector to achieve worthy public goals & objectives, neither of whom are able to achieve on their own. By law, public sector entities must meet a “public purpose”; are they being monitored to see whether this purpose is being achieved? No. Do we see transparency or accountability at all levels of the non-profit & govt levels? No. Regrettably, Chamber types & their cohorts of bankers, lawyers, developers,marketers, designers, architects, etc. now say they do “economic development”, which reveals not only their ignorance, but it reveals how poorly our “profession” has become, cannibalized by the strong economic forces which have long dominated the planning landscape. Pls note that “economic development” is a public term, not a private one. What would be the logical public goods or outputs from the use of massive amounts of public funds year in & year out? It isn’t to expand the built environment, stress the natural environment, increase taxes, fees, and burdens upon middle & lower income families, or to promote gentrification. It isn’t to define “success” in business terms, but in socioeconomic terms, but this idea continues to be a top secret. Unless “economic development” is clearly understood for its public sector goals & objectives, distinct from private sector pursuits, we will always suffer from conceptual conflation, rendering key planning terms, concepts and principles as meaningless. We need referees to throw big red flags each time the “economic development” term is used & abused, which easily can lead to full time employment for many of us. I don’t know of any other “profession” so self-afflicted. I failed to add my most important point from my previous comments, and that is, in our history, the U.S. has NOT practiced “economic development”. With the heavy use of public subsidies, we have practiced business development to artificially “spur economic growth”, and, we have practiced public-private partnerships, to achieve needed public infrastructural improvements. But these efforts or achievements do not constitute “economic development”, as they all involve expanding the built environment, the “urban” planner’s idea of “economic development”. A natural, healthy, competitive business environment would accomplish these activities WITHOUT the need for public subsidies. Given that heavy subsidies are used at all levels of govt to achieve “economic development”, reveals the weaknesses of our capitalistic system. Unless, and until, “economic development” focuses upon moving the needle in socioeconomic terms, aligned with its legal requirements as a public term to fulfill their tax-exempt “public purpose”, we are not practicing “economic development”. Done right, standards of living & quality of life outcomes will be achieved in real terms because public funds were wisely leveraged with the private sector to “move the needle” in a positive direction. Note that we cannot continue to see “strong economic growth” using economic development funds and yet see a growing divide between the haves and have-nots, economic segregation, and concentrated, structural poverty at the same time. Folks in public office confuse private sector growth & prosperity with “economic development” rhetoric, which only reveals that they don’t know basic planning terms & concepts. Private is private, public is public; “economic development” is a public concept, hence, the need to see public outcomes in areas where community needs are greatest, not where market-ready areas are primed for more growth to help influential commercial real estate interests & all of their cronies. This is the way the game has been played for centuries. The two ships on the water ideally represent our two sectors, public and private, working as a team to accomplish mutual goals and objectives. Unfortunately, the private ship has boarded the public ship & taken its goods in the name of “economic development”, defined as a “success” because it has privatized the benefits and given a token fee to the captain & his crew (Mayor & Council) of the public ship for forfeiting their public responsibilities to the taxpayer who paid for it. The Chambers of Commerce & business press applauds such success, as this is an example of entrepreneurship, creativity, and initiative. It all looks good on paper, until the Titanics hit the icebergs, which happens every day. In my neighborhood/state economic development is giving tax breaks to millonaires for real estate speculation and money to the medical industrial complex to create jobs for the already wealthy and educated. A Harvard researcher just came out with a study that shows that relying on the medical industrial complex makes health care unaffordable. But that information is not allowed a seat at the table because it is all the rich have to work with here. Much of my work is trying to prevent the rich from self dealing in a way that harms communities and stopping their really bad projects that create some private profit but saddle the community with huge debts. Thankkfully we ahve been able to stop some of the worst scams like container ports that if built would have opened as the Great Recession started and baseball stadiums. Your article is useful for the historical perspective on the thieves.